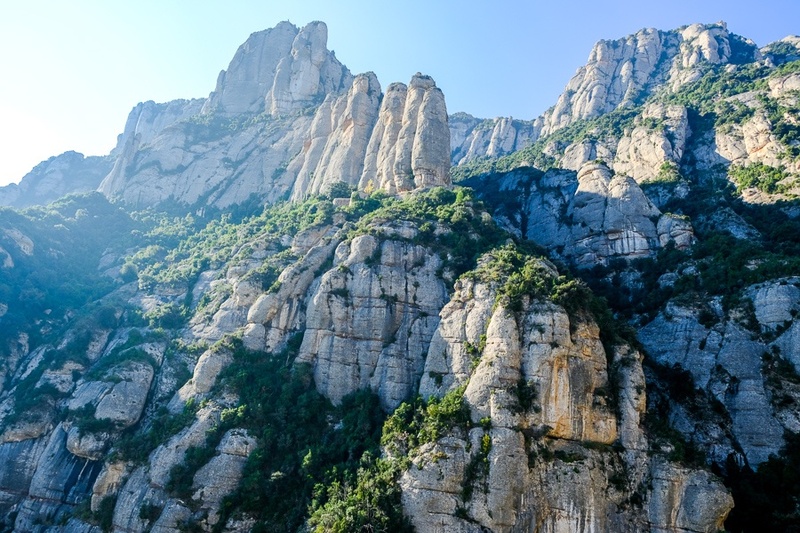 Montserrat is a national park in northern Spain, and it has one of the best mountain ranges in the whole country. It’s also the location of an old Catholic monastery from the 11th century that you can still go inside today. The sights in this park are awesome! The name Montserrat means “serrated mountain” and it comes from the jagged shape of the mountain peaks when you look at them from a distance. I visited Montserrat in October and spent the whole day hiking there, but easily could have stayed longer. It was a great experience. Montserrat is about 1.5 hours from Barcelona and it’s very doable as a day trip, but some guidance will be needed. This page will explain how you can do it on your own, without a tour, and with a very modest budget and minimal planning. Read on! Montserrat is pretty easy to reach on a day trip from Barcelona. First of all, if you’re on a tight schedule and want to skip the extra steps involved in arranging your own trip to Montserrat, there are a number of companies that offer prearranged day tours for as low as $40 USD, with an English speaking guide and four-course lunch included. If you’d rather make your own arrangements and go without a tour, that’s covered next. There are three main ways to get to Monserrat: train, bus, or car. I’ll explain the train method here first, since it’s the most common way to get to Montserrat and is generally what I’d recommend. The train takes you to the foot of the mountains at Montserrat, and then you take a quick cable car or rack railway the rest of the way up to the national park. Montserrat as seen from below, just before boarding the cable car. Montserrat monastery and plaza as seen from one of the main walking paths. Step #1. Reach The Starting Point. Go to the Placa d’Espana station. You can use a taxi to get there or just walk to the station from your hotel, which is what I did. When you get to the station you will want to look for route R5 (Manresa), which should be clearly marked as ‘To Montserrat’ or you can also ask for help at the info booth there. Step #2. Buy Your Tickets. As of 2019, the price for a return ticket is €22. The train will depart about once per hour. Full time tables can be found on the Aeri website here. For visiting Montserrat there are two ticket types: train + cable car or train + rack railway. You will need to pick one. I would recommend the cable car (pictured below) because it’s quicker and more scenic. If you’re scared of heights, then the rack railway may be a better option for you. Step #3. Ride The R5 Line. The train journey through the Spanish countryside takes about 1 hour. If the train seats are full you may have to stand, but it’s not too bad. Depending on which ticket type you bought in step #2, you will want to get off at the ‘Aeri de Montserrat’ stop (for cable car) or the ‘Monistrol’ stop (for rack railway). Step #4. Ride The Cable Car / Rack Railway. The cable car ride takes about 5-10 minutes and the views through the glass windows are incredible as you go up into the mountains. It can be a little cramped in the cable car and you may be standing shoulder to shoulder, so watch your belongings. If you decided to take the rack railway instead of the cable car, then the ride is about 15 minutes. Step #5. Enjoy Montserrat! Once you reach the plaza at the monastery, there are lots of things to do. You can go inside the monastery, grab a bite to eat at the cafe, start hiking up into the mountains, or take the Sant Joan Funicular (yes, yet another railway) to reach the main junction of trails further up the mountain. I would recommend the latter option. The cable car ride takes about 5-10 minutes and the views are incredible. The view right after you step off the cable car. There is a company called Autocars Julia that runs a bus daily from Barcelona to Montserrat and back. The bus only runs once per day in each direction. It leaves from the Estacio Sants train station in Barcelona at 9:15 AM, and then goes back at 6 PM. The price is €5.10, so it’s a bit cheaper than the train option. Their contact number is +34 93 402 6900, and more information can be found on their official website. If you rent a car in Barcelona, you can drive to the Montserrat parking lot and then ride the cable car or rack railway mentioned in the train section. If you’d rather book a tour, there are also some companies offering prearranged day tours to Montserrat with a guide. The view looking back, right after finishing the cable car ride. You can get some amazing views like this with only a short hike in Montserrat National Park. The first thing you’ll see in Montserrat national park is the jagged mountains stretching up around you in all directions. Montserrat has a bunch of hiking trails, and they all give you great views of these unique looking mountains. After you’re dropped off at the monastery plaza in Montserrat, I’d recommend taking the Sant Joan Funicular up to the main junction of trails and then doing several hikes from there. This is what I did and it allowed me to knock out most of the trails in Montserrat in one day. One of the mountain views from the Montserrat plaza. If you use the main junction of trails as a starting point, all of the hikes are relatively flat and easy, so if you keep a good pace then you could probably finish all of them in one day. The last cable car down from Montserrat is at 7 PM, so if you start your day early then you’ll have lots of time for hiking and sightseeing. If you happen to be a rock climber and you’re looking for something more difficult, there are also lots of great opportunities for that here. Otherwise, you can still walk the main trails and get some incredible views of the mountains in Montserrat. Montserrat is a great place for rock climbing. One of the first views from the Saint Jeroni trail. The Catholic monastery at Montserrat is from the 11th century, and the inside is awesome. The ceiling of the basilica is really impressive, and there’s even a huge pipe organ inside that dates from the 1800s. It’s free to go inside the monastery, and photos are allowed in most rooms. It doesn’t take very long to tour the monastery, so I would give hiking first priority unless you’re really interested in the history or architecture of the monastery. I visited the monastery at the end of my Montserrat trip, and spent about 30 minutes inside. It’s definitely worth going inside at least briefly. Artistic figures on the outside of the monastery. Inside the basilica of Montserrat. Montserrat has a small museum that includes some pieces from well known artists like Monet and Picasso. The entrance fee for the museum is €7. Near the monastery there’s also a cafe and restaurant, but the prices for the food there are pretty high so it’s better to pack a lunch or eat in Barcelona if possible before coming to Montserrat. The main plaza at Montserrat. Another classic view from the main junction of trails in Montserrat. See the rock climber in blue?